BOOM. The explosion of the gas station at the corner of Ross Avenue and North Central Expressway shook the street. A brilliant orange and black mushroom cloud immediately rose up, enveloping the gritty block and burning everything in its path. 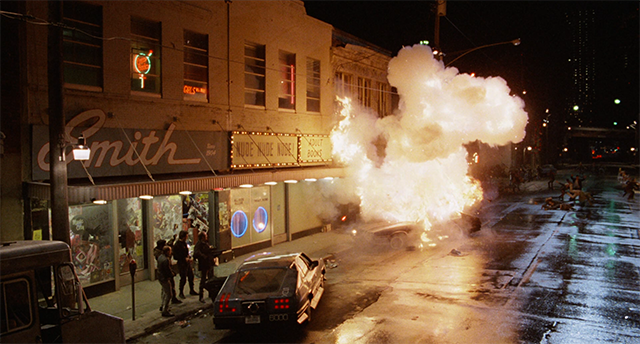 After a brief moment, a metallic-clad humanoid robot emerged, glowing from the wreckage of the flames: RoboCop. This was the making of the iconic science fiction satire, the largest movie production to be filmed primarily in Big D at the time. In order to research for this article properly, the editorial board felt it was critical we interview RoboCop himself—a proposition that I was happy to undertake. Peter Weller, the actor in the suit, has a long history in film, both in front of and behind the camera. Today, he holds a doctorate in Italian Renaissance art history and Roman history from UCLA and is well-versed in the history and health of some the oldest cities in civilization. Weller, a riveting conversationalist, has keen insight on the message of RoboCop, which is instrumental in drawing a parallel between two iconic American cities. 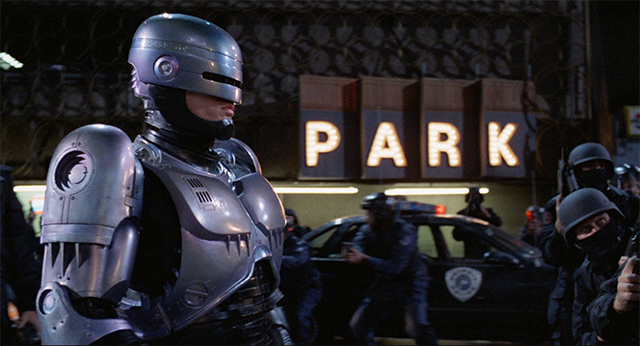 Filmed in the late hot summer of 1986, RoboCop offers a story of what could and did happen to many American cities. 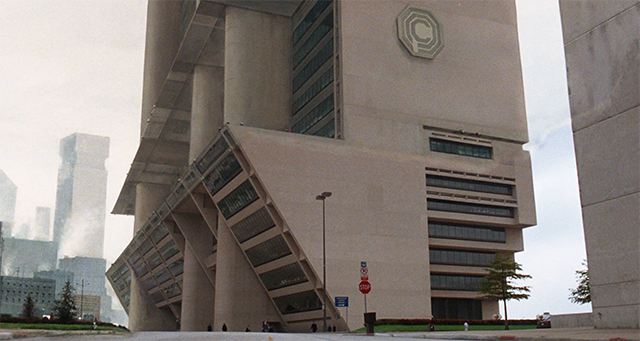 Using the Dallas skyline as a stand-in for Detroit, this satirical film of a dystopian future created by greedy capitalism came to Dallas with a literal roar. Thirty years after filming, Dallas and Detroit have taken very different paths. Comparing them provides insight into what makes an urban environment resilient in the face of change. Today, Dallas appears to be prevailing, its substance rooted in the combination of a diverse economy, the success of regionalism, business-friendly perks and policies, and a relatively low cost of living. Detroit is on the rebound, but only after an economic collapse and a declared bankruptcy. It saw its population shed by over 60%—from the fourth largest city in the U.S. in 1940 to the 18th largest city after the Great Recession, according to the U.S. Census Bureau. In that time, Dallas has doubled its population and the greater metropolitan area has increased by over 400%. In order for a city to exist successfully, it requires an economic purpose and a community that supports its growth through urbanization. However, these artificial environments are intrinsically never in equilibrium and always at risk of collapse. The development of socio-economic inequality through political imbalance and poor city management, a failure to invest in infrastructure, and the inability to control crime are all internal obstacles. A good governance is essential to the health of a city. It requires a foundation that is structured to respond to its citizens through transparency and the ability to innovate fluidly in response to dynamic changes in growth. The city must be positioned for maturation within the region beyond its urban edges. As the country evolves, so must the city in regards to its economy. Diversity of industries ensures the ability to weather a collapse when specific markets decline. This proximate variety also encourages innovation by fostering collaboration and channeling new ideas when diverse markets interact. Last, a city must be able to attract and retain a vibrant working class. This begins with investing in its infrastructure and constantly revitalizing city centers. Provisions for education, transportation, security, and entertainment are all vital elements. Its neighborhoods require thoughtful planning, and its architecture must be inspiring and successful at connecting communities. Resilient cities are forged not built. Their success is earned through diversified growth over long periods of time. An eclectic assembly of architecture within an urban core is a tell-tale sign of its maturation. 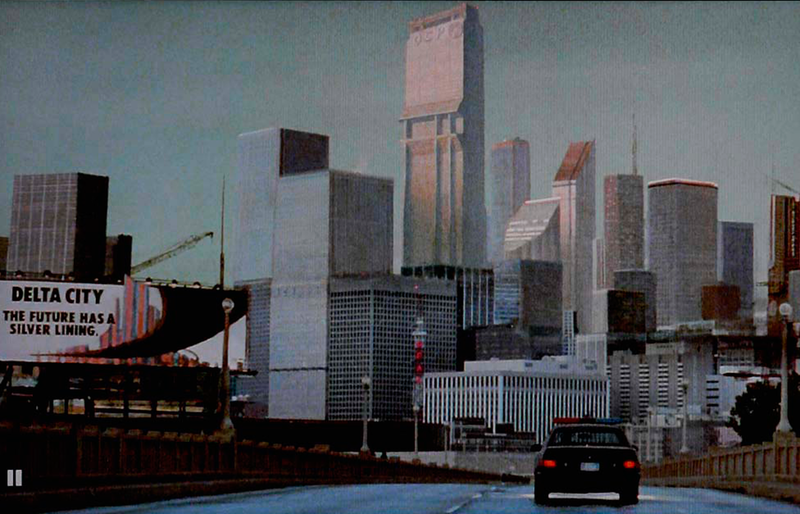 Delta City, the massive urban renewal project envisioned in RoboCop, imagines a new city center for future Detroit. 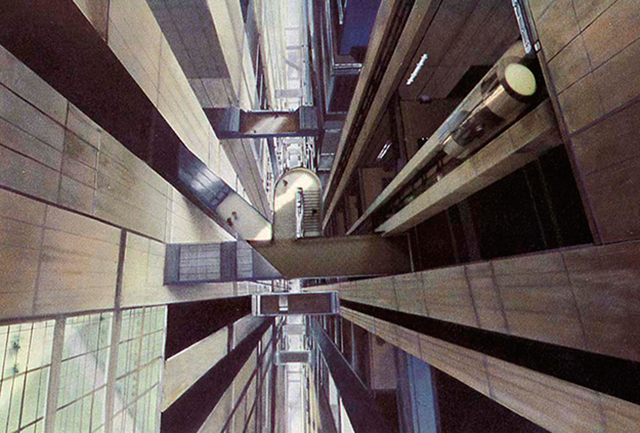 Privatized in its development, the concept offers a satirical look at the failures of similar real world constructs. Detroit learned these lessons with disastrous effects. The golden age of Detroit is a case study for the advancement of culture and society due to urbanization; its collapse is a cautionary tale of poor governance. “Detroit rose and fell with the automobile industry,” said Thomas Sugrue in From Motor City to Motor Metropolis: How the Automobile Industry Reshaped Urban America. 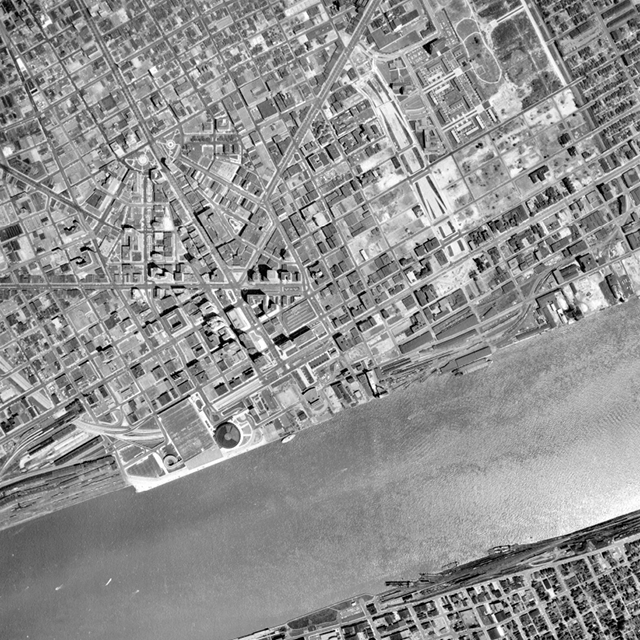 Situated in the heart of the Rust Belt, Detroit catapulted to the status of a top-tier American urban city with the advent of the mass-produced automobile. The automotive brands that comprise the Ford Motor Company, General Motors Company, and Chrysler dominated the world market after World War II. Innovation was a key element in the success of these companies and the city that housed them. Early successes of unionization supplied higher pay and the security of pensions for employees and their families. This structure also diminished wealth inequality and allowed the citizens to flourish as the automotive market continued to grow. This was particularly evident through the advent of the black middle class by the 1960s. Motown Records, founded in 1959 by Berry Gordy in Detroit, is often characterized as giving America music the way the automotive industry produced cars: an assembly line of hits that had a distinct impact on American culture. The surging minority population was given another voice by the success of Motown music. Detroit’s prejudice was constantly challenged to progress with the ongoing Civil Rights Movement goal of racial desegregation. A prevailing American idea to take hold during this time frame was large-scale urban renewal as enacted by the Housing Act of 1949. In his 1977 book The Language of Post-Modern Architecture, architectural historian Charles Jencks famously defined the demolition of the mass housing development Pruitt-Igoe in St. Louis as the “day Modernism died.” However, it was more than a failure of architecture. It was a failure of governance and planning, willfully turning a blind eye to the hazards of segregating low-income housing and displacing minority low-income neighborhoods. Ironically, the site of the now successfully integrated and enduring Lafayette Park, an urban renewal project planned by architect Ludwig Mies van der Rohe contributed to the displacement of low-income neighborhoods in the 1960s. The Civil Rights Movement was a strong presence in Detroit, a leader in race relations. This unfortunately culminated in the 1967 Detroit riot, the third and bloodiest race riot in the city since the start of the Civil War. Its epicenter was at Twelfth Street (renamed Rosa Parks Boulevard in 1975) on the northwest side of the city. At its conclusion, President Lyndon Johnson said in an address to the nation: “In America, we seek more than the uneasy calm of martial law. … Not even the sternest police action, nor the most effective federal troops, can ever create lasting peace in our cities.” Nonetheless, the riot had been subdued with militarization of its police force with over 13,000 National Guardsmen and U.S. Army paratroopers. The tale of RoboCop’s militarized police force with a fleet of hulking drone-like ED-209 “Enforcement Droid” killer machines loses its satirical humor imagined in the wake of these tragic riots. 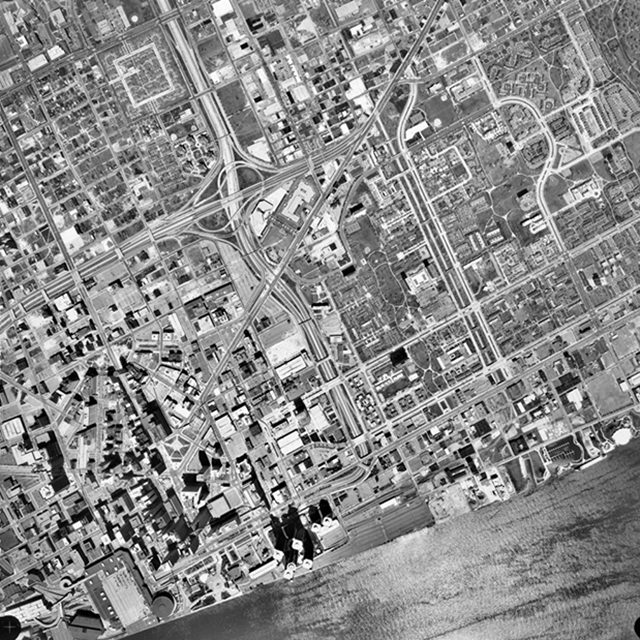 The complex, compounding events that contributed to the battleground included “White Flight” due to desegregation of schools through the Civil Rights Act of 1964 and the deindustrialization of the core as the automotive companies decentralized production and relocated to the suburbs (partially at the encouragement of the U.S. government due to fear of nuclear missiles during the Cold War). The passage of the Federal Aid Highway Act in 1956, ironically due to the success of the automobile, divided the city further upon the construction of the Chrysler Freeway: Interstate 75/375 in 1964. This contributed to the reduction of the urban fabric and the increase in urban sprawl. The city that lived by the car died by the car. Streetcars were eliminated and the infrastructure for mass transit was never developed. The population drop that began in the 1950s dramatically increased in the 1970s with the rising cost of energy and globalization of the automotive industry. The result? Manufacturing moved to other countries where the cost of business was significantly cheaper. The Japanese automotive industry accelerated in the 1960s and overtook the U.S. automotive industry in production worldwide by 1980. Toyota established a California-based U.S. headquarters in 1957: Toyota Motor Sales, USA, Inc. Honda began building its Accord model in Marysville, OH, in 1982. Meanwhile, Motown Records had relocated to Los Angeles in 1972 in an effort to collaborate with Hollywood. The decline of Detroit was undeniable. 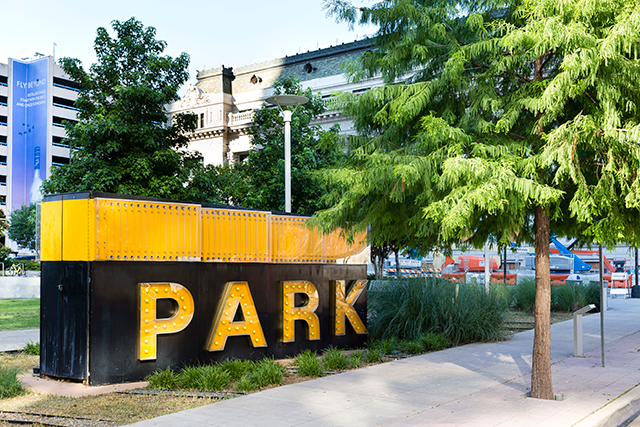 While Dallas was incorporated just 50 years after Detroit, its actual initial settlement is more than 100 years younger, dated to the founding of the Republic of Texas. The Dallas population swelled for 30 years after the Civil War, and the urban core began to take form by the beginning of the 20th century. It wouldn’t be until RoboCop spawned a sequel 90 years later that Detroit and Dallas had populations of equal size—one declining and one still growing. 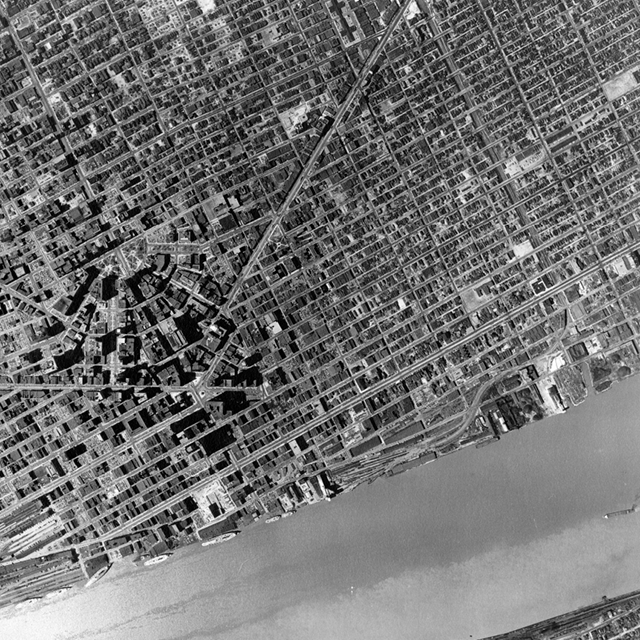 However, Detroit literally paved the way and built a model for new American cities in the 1950s and ‘60s. Dallas’ growth slowed as it gave rise to urban sprawl. The 1957 Thoroughfare Plan of Dallas produced highways that divided the geography of the city’s urban core. Concerned business and civic leaders struggled to revitalize the downtown area in fear of losing the tax base to the suburbs. The Greater Dallas Planning Council and the Dallas Citizens Council, a conglomeration of business leaders that have historically had a heavy influence on the shape of the city, invested in stymying this migration. Urban renewal, driven by the federal Housing Act, was the perceived perfect solution as it began to sweep American cities. In For the City as a Whole: Planning, Politics and the Public Interest in Dallas, Texas 1900-1965, Robert Fairbanks notes, “[Urban renewal advocates] formed a rehabilitation committee in 1953 to enforce housing codes and upgrade deteriorating neighborhoods. Led by developer Trammell Crow, the group selected a 28-block area just northeast of the downtown business district to fight blight and slum conditions and to develop ways of eliminating or correcting those conditions.” This was “Little Mexico,” and is now the site of the American Airlines Center, the fledgling Victory development, and portions of the Harwood District, a neighborhood of sleek glass towers. In regards to politics and racism, Dallas avoided any significant race riots. However, the displacement of low-income housing in the 1930s and 1940s encouraged civic unrest. Fairbanks documented a Dallas Express editorial from August 1941: “Dallas changed from a comparatively peaceful city, with race relations normal and cordial, to a city that is a veritable powder mine, requiring just one small spark to set off a race war.” The parallels to Detroit are eerie. Economically, what had begun as a trading post evolved into a mercantile hub for cotton, an oil town, and then a technology center spurred by Texas Instruments and the invention of the integrated circuit by Jack Kilby in 1958. This diversity and momentum drove Dallas into a real estate bubble, becoming the fastest growing metropolitan area in the nation. Defined by late modern and postmodern architecture of glass and concrete, large-scale development of towers and open plazas reflected the ideas of urban renewal. 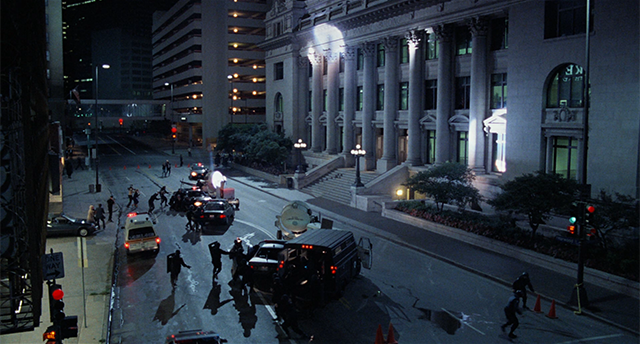 The dramatic reimaging of the City of Dallas was to come to a screeching halt by the time Hollywood arrived in 1986 to film RoboCop. The savings and loan industry, which had funded the momentum of development, collapsed and crippled the economy of the region for a decade and the urban core for nearly two. Perspective from the passage of time eases the effort to compare Dallas to Detroit in many regards. 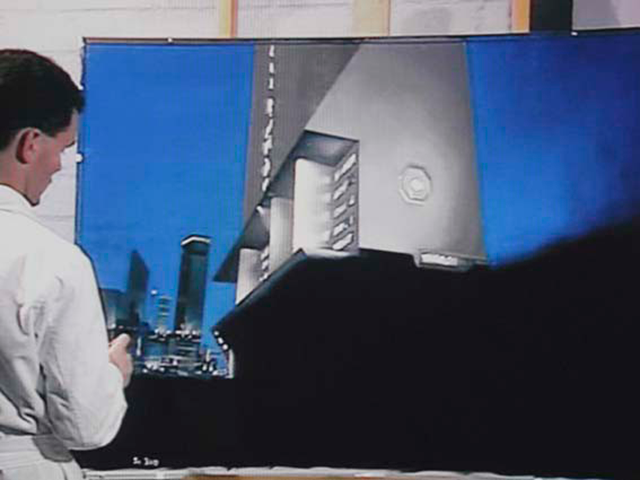 But in 1986 the two cities appeared strikingly different in their urban developments as the prevalent architectural styles of Postmodernism had taken root in the younger city. Delta City, the imaginary mega urban renewal project to privatize and reinvent future Detroit, had arguably taken root in the real Dallas metroplex. 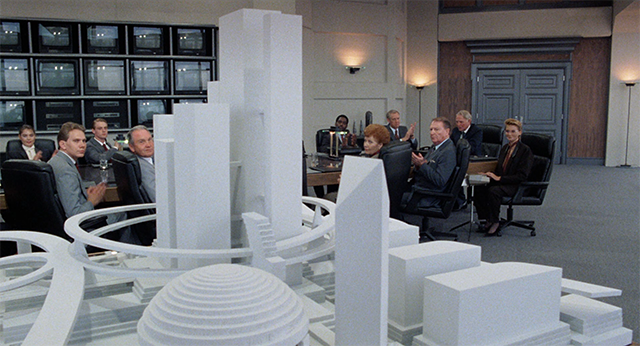 The concept of Developer Ben Carpenter’s Las Colinas (complete with its own monorail) matched the blueprint for the large architectural models of Delta City depicted on film within Renaissance Tower in the futuristic boardroom of Omni Consumer Products. 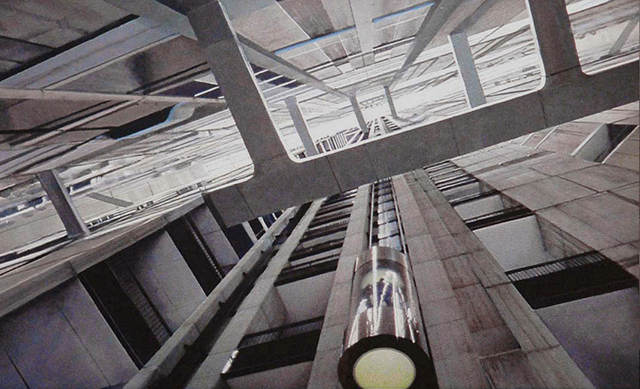 The movie’s tallest building was a matte painted ultra-high rise that reached 100 stories and extruded out above Pei’s Dallas City Hall. A growing trend in America, beginning in the 1970s, was adopting the concept of deregulation. It was welcomed by cities plagued with growth of government and overburdened with entitlements. The implementation of deregulation began with energy, transportation and finance. Notably, the Depository Institutions Deregulation and Monetary Control Act was signed into law in 1980. This law expanded lending power without providing appropriate federal oversight. In Dallas, this contributed to the savings and loan crisis that ended the development boom. Today, Dallas has shown promise in fulfilling the traits of resilience. Growth rates within its suburbs are not rivaled, yet the urban core has more than doubled in population in the past 15 years and is projected to double again over the next 15, according to the North Central Texas Council of Governments’ (NCTCOG) Regional Data Center. Its growth is driven by a changing workforce and somewhat through identification with the concept of youthification. Low-income housing failures still plague Dallas as a result of poor policy and a lack of fortitude in enforcement by our governance. A concurrent challenge rests within the educational system which faces a continued struggle to improve by experimenting with chartered schools and a collaborative effort of private and public institutions. These issues must be resolved if Dallas is to compete with the suburban living environments of other large urban cores. 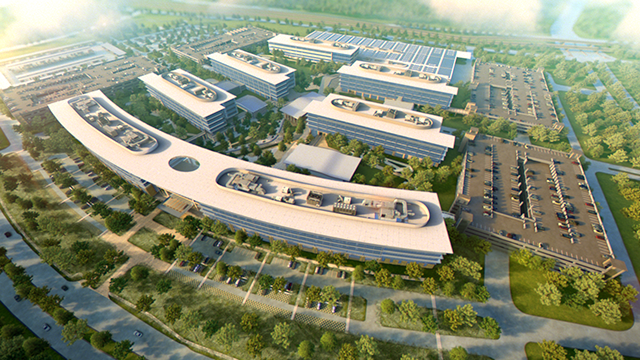 Over the past two years, a large cadre of architects and interior designers at my architectural firm, Corgan, have been busy designing and assisting in the construction administration for Toyota’s new U.S. headquarters. Construction of this massive sustainable campus signals a defining juxtaposition of the two cities. However the changing of the guard is bittersweet. Lured to the Dallas metroplex significantly by an economy defined by a low cost of living and a pro-business environment, the largest manufacturer of automobiles in the world will be located nearly 20 miles from the city center—further enhancing the urban sprawl of the region. 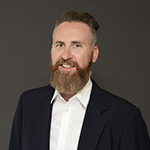 James Adams, AIA, RIBA is a senior associate at Corgan. In preparation for this article, James Adams, AIA and Kevin Sloan, Hon. 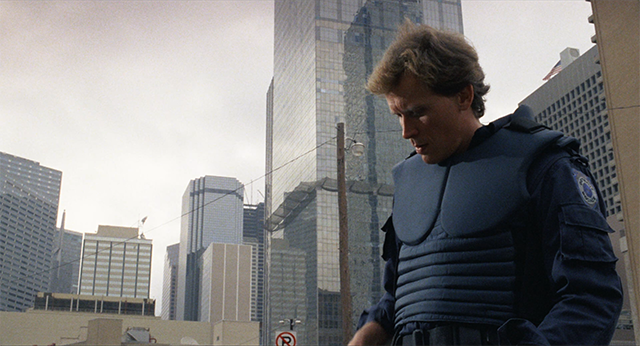 AIA Dallas interviewed Peter Weller, the lead character in the movie RoboCop. Read the full transcript here and Kevin's profile of Dr. Weller here.